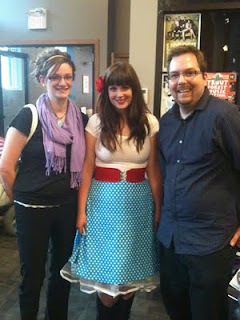 I recently got to see Meaghan Smith in concert. (Sorry to the people in Vancouver who's show got cancelled because of the rioting, what a let down) It was superb! Meaghan Smith is the most recent Juno Award winner for Best New Artist. She has a brilliant voice. So original, that listening to her live sounds better then the recorded version of the songs. I heard a lot of other people see that too! Best part of the show was that the encore that audience pleaded for. She came back on stage and said comically "Are You Sure? Do you remember that Juno I won, it was for best NEW artist. I only know so many songs." I love that she was personable and wanted to meet her fans after the show. You had better believe I took my wife with me to go meet her. She also responded to one of my tweets before the show. Just an absolute delight. I didn't have cash at the show to buy a t-shirt. When I got home I ordered one online, because I would rather support examples like her for my kids, then Miley Cyrus. You can imagine how distraught I was when the order was cancelled a couple of days ago because the t-shirts were no longer available. One day when new products are listed, I will be all over that site. If you haven't heard of Meaghan Smith, check her out at her website, her MySpace page, Twitter, or on Facebook. She is Canadian talent that you need to hear. Candy for the ears.